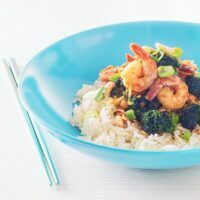 This Teriyaki Shrimp with Broccoli dish is one of those crazy quick moorish dishes that will have you dumping those takeaway menus! This Teriyaki shrimp recipe is the perfect quick fakeaway and is the perfect way to ditch those takeaway menus. Ready in 20 minutes from your cupboard to your table. The local takeaway will be hard pushed to deliver quicker than you can make it and it tastes sublime! 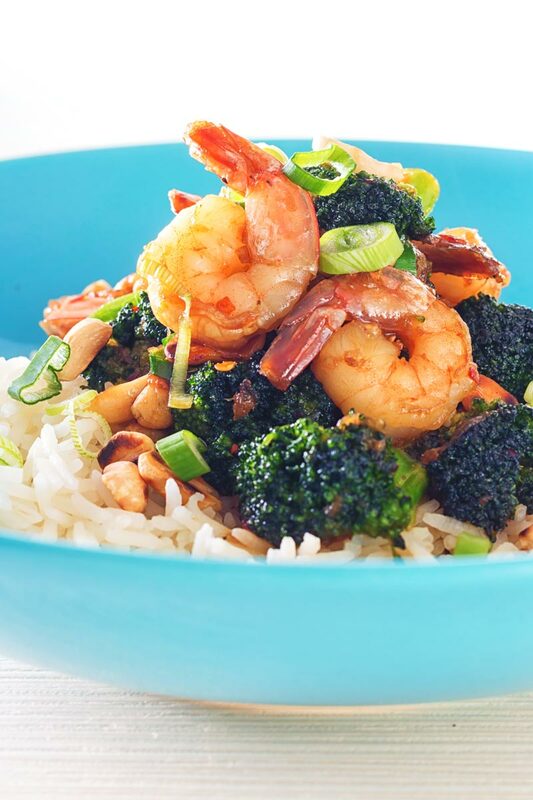 It has been a while since I have taken inspiration from someone elses website so this teriyaki shrimp with broccoli dish makes a nice change. A visit to an Asian Fakeaway courtesy of the pages of Richa over at My Food Story. I love the food on her website. Like me, she thrives on a whole host of different types of food. I think diversity is the sign of a great home cook and a quick stroll around her pages will reveal a whole world of flavour. Of course, I changed things up a little and added some nuts because I love them in stir-fries. The sauce remains gloriously simple, slightly spicy, sweet and salty. Essentially my favourite, heck, probably the worlds favourite flavour profiles! All of which match up against the shrimp and broccoli perfectly. Anyway, enough of that what about the food… Mmmmm it’s tasty, really tasty. Shrimp Recipes, The King Of Fast Food! 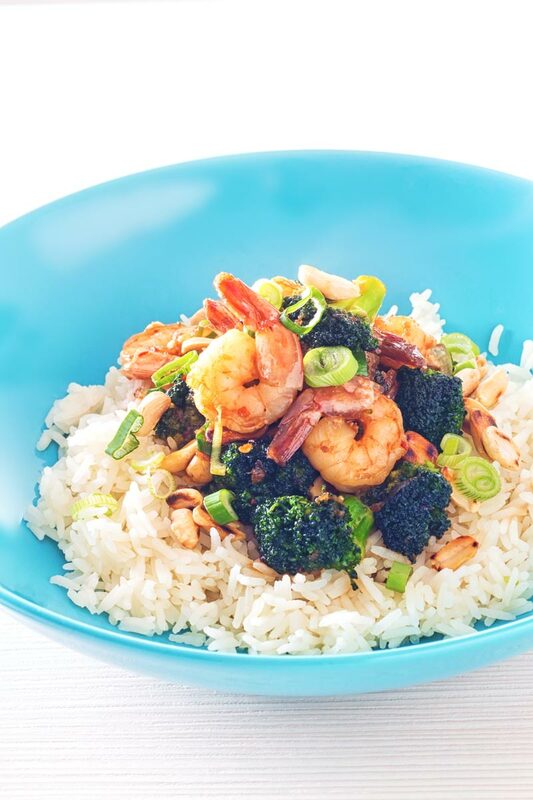 Naturally this shrimp teriyaki recipe can be made with unfrozen prawns or even frozen raw prawns. Your timing will just need to be changed accordingly. If you ask me shrimp are the king of fast food. They cook in mere seconds. This whole teriyaki shrimp dish takes just 10 minutes to cook, bolt on 10 minutes for prep and you have one seriously fast meal! Not only that but they are also really versatile, they are much loved the world over. You could go Indian Shrimp, Italian Shrimp, BBQ Shrimp, American Shrimp and I am sure I will add to this list as time goes on. They are also great from the freezer. The perfect, “get in with no idea what to cook” ingredient. My freezer is always stocked with a few bags of frozen shrimp! Of course, my site is always refreshed with new shrimp recipes! Most importantly they always feel special, and we definitely all deserve that! How To Cook Fast Food At Home. No matter how we live our lives we all have a need for a fast cooked dinner every now and then. The key to cooking fast food at home is all in your choice of ingredients. Fish and seafood is always a great start because it requires so little cooking as this shimp teriyaki recipe shows. But it is not just all about fish, steak and some cuts of pork always cook quickly. If you are cooking meat then you are looking for meat from a part of the animal that does not ‘work’. So, for instance, pork tenderloins roasts in just 12-15 minutes. In fact in this pork tenderloin with pickled fennel cooks in just 30 minutes. That includes the pickles! The other key is planning, I never go into the kitchen and look in the fridge with no idea. I have a general plan for all of the meals I cook when I go shopping. It really does scale back on the time you spend in the kitchen. In other news, my wife told me that it is April next week! So own up who stole the first quarter of 2017, I genuinely cannot believe that spring is springing and that all of that nasty winter stuff has gone. I love it and long may it last, well when I say long… I mean until I get bored of the same old produce again and long for the days of roots and hearty soups and stews! Begin by making your sauce by combining all of the ingredients and bring to a boil, when boiling reduce the temperature and allow to simmer on very low for 4-5 minutes to allow to thicken. Heat half the oil in a wok or pan, and add the chopped garlic. Saute for a minute and add broccoli and the mixed vegetables. Stir fry on high heat for just a minute or two and remove them on a plate. Heat your dry wok over a high heat and toast your peanuts, do not take your eyes of them they burn really quickly, when toasted set aside. Now take your wok and heat until shimmering hot and add your oil, add the garlic and stir fry for 60 seconds. Throw in the broccoli and white parts of the spring onions and stir fry for 3-4 minutes. Then add in the shrimp and stir fry for a further 2 minutes. Pour in the sauce and allow to bubble for another 2 minutes. Remove from the heat and add in most of the peanuts and the green parts of the spring onions, reserving a few to garnish. 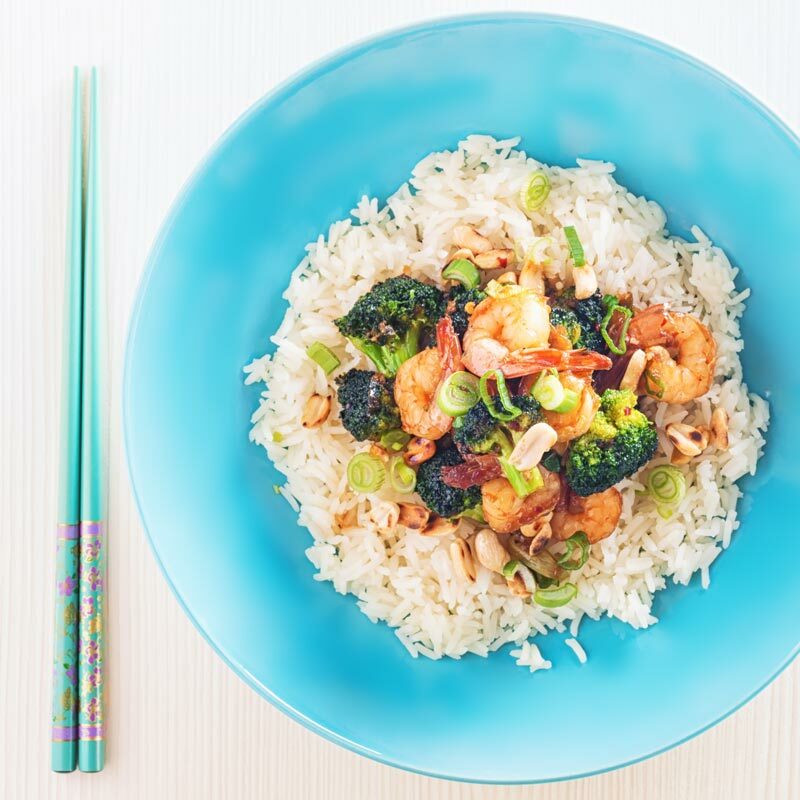 Serve with some simple Jasmine Rice. This looks so good I just had to share! Thanks for posting! What a stunning, healthy dish. So full of flavour too! Oh and I also love My Food Story 😉 you are in good company. Thanks Emma, There is certainly some awesome food on offer over there. I feel like the 1st quarter and flown by, too! Oh, I love Asian Fakeaways – this teriyaki shrimp looks absolutely delicious! Ha I’m totally the same I can’t wait for each season to come and use different seasonal ingredients. This looks like one tasty meal and I love the addition of peanuts, yum! I love a recipe that is better than takeaway and this one really looks like it is! I want to know who stole the first 3 months of they year too, but glad it’s spring! Oh Brian – that header image is perfection! I love how the bowl fades out and how it matches the chopsticks so perfectly. Really beautifully done. Richa’s dish caught my eye too – I have it on the list of things to try. And I’m with you on someone thieving the first quarter – I can’t work hard or long enough to keep up at the mo!